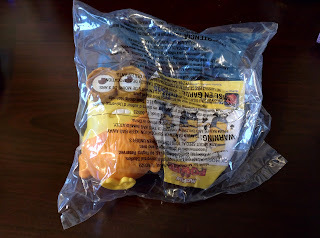 Recently, I began reading about how there are many people who are either amused or outraged that the McDonald's Happy Meal toy of a caveman Minion from the Minions movie reportedly utters the phrase "What the f---". Being a fan of the Minion characters and somewhat amused by the controversy, I decided I had to get one of these toys for myself, and I did. This particular Minion toy makes three separate noises. The first is "para la bokay" which presumably is Minionese for something. The second noise is "eh eh" which comes out of the toy sounding more two bursts of static or two crashing sounds. The third, which many people interpret as WTF, is actually Minion laughter. If I listen to the toy and expect to hear "What the f---" then that's exactly what I will think I've heard. 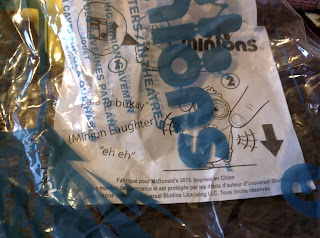 On the other hand, if I listen to it and expect to hear (as the paper indicates) a Minion laughing, it sounds more like "huh huh HUH" - which each "huh" getting slightly louder. That's what the creators meant for it to say. This teaches us something about how our brains process sound. A perfect example of this is something I see every few days. There is a car which parks next to ours most days at the office. There is a round plastic disc on the side of that car's headrest, at about the height you'd expect an ear to be if the driver was seated inside. Consciously, I expect eventually to pull into the space while the owner of the vehicle is inside it, so I'm expecting to see a man seated behind the wheel. If I watch myself, I see my brain assemble the picture of that headrest with its plastic disc (a roundish object) for a split second as the side of the driver's head, with the ear (a roundish object) right about where that plastic disc is. Just as quickly, it turns back into the headrest that's really there. I discovered this one morning when I thought I saw the driver inside, got out to greet him, and found the car empty (and no one in sight). The next morning, I watched myself and actually believed for just the briefest instant I saw the driver before the headrest came into full view. It's happened several times since then. Now that I know my brain does this, I've seen it occasionally feed me a false image just before showing me the real one. 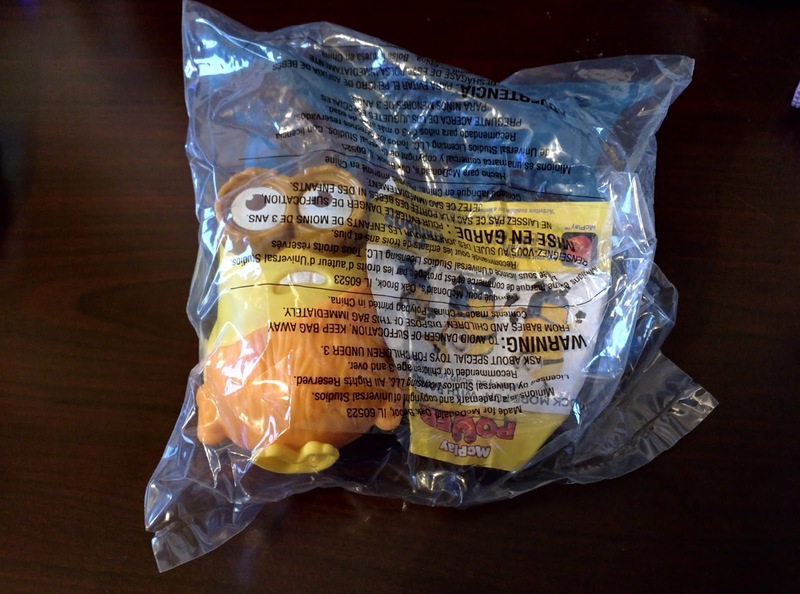 The Minion toys are designed to be inexpensive trinkets that the burger chain can give away with a meal (or more accurately, build into the cost of the meal). They'll sell you the toy by itself for less than $2. That tells you it probably contains less than a dollar in parts (here's a look inside one of them). Inside the toys you find a switch, a cheap little speaker, some batteries to power it, and some electronics to store and play the sounds the toy makes. The odds are good that if you hooked the crappy little speaker up to a high quality audio source it would still sound bad. Then, putting the speaker inside the hollow plastic toy would make it sound even worse. When you toss in the fact that the cheap electronics inside the toy aren't storing high-resolution full-stereo sound, it's a wonder that we can make out anything the toy says. There's not a lot of detail there for our minds to work with, and what is there is distorted by the cheap speaker and hollow shell. It's no wonder that two people listening to one of these toys will hear two different things. If your child thinks the toy says "WTF" then a question you should ask yourself is not whether this toy is really saying that or not, but where your child heard that phrase so that he or she could imagine that this is what the Minion is really saying. Then, grab the paper that came with the toy and show them that although you can imagine why they think it might sound that way, it's actually laughter... "and by the way, little Susie, where did you hear that awful language?" I don't believe that McDonald's would have intentionally released a toy that utters four letter words. The number of outraged parents would outweigh the publicity benefit. But I do admit it's odd that a toy that even kind of sounds like it might be uttering profanity wasn't detected until stores began selling them. My best guess is that maybe they heard a pre-production version with a better speaker inside it, then negotiated for a lower price before closing the deal. The factory swaps out the better speaker for the cheaper crappier one, and ships the toys. The company blasts them out to the franchises and gets blindsided by the fact that the cheaper speaker distorts a laughing sound into WTF. (At least, this is how I would like to think it happened.) There is a lesson here, not just for McDonald's but for any company manufacturing toys that make sounds... be sure you run the finished product by a bunch of people with different ages and backgrounds. You might avoid something like this.